Transforming Technologies ESD inspection gloves are designed to be worn when handling ESD susceptible items. They are made with a dissipative nylon to reduce charge generation. Polyurethane coated finger tips allow for a high level of tactile sensitivity and increases breathability. A seamless fine gauge knit and a finished rolled cuff are designed for comfort. 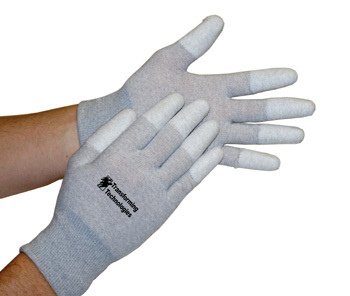 Transforming Technologies' ESD inspection gloves may be laundered for repeated use. Sold in packs of 12 pairs.